After my last post, I know you’re all relieved to know that we finally settled in around the one pool in the greater Las Vegas area that did not have loud music. It was a plain rectangle that was in the shade of the high rises until 1:00 every afternoon but we made do. The highlight of my reading was this: “The Peanut Puzzle: Could the Conventional Wisdom on Children and Allergies Be Wrong?” Sorry, they won’t let you read the article. Since 2000 the “conventional wisdom,” endorsed by the American Academy of Pediatrics, has said that parents should wait until a child is 6 months old before introducing solid foods. Then parents should start with the foods that are least likely to cause allergic reactions. 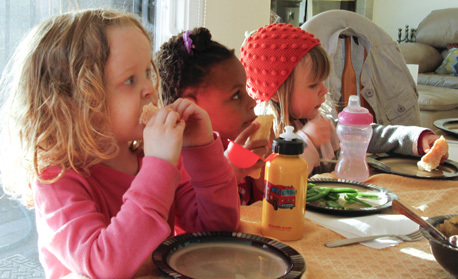 This late introduction was thought to make children less likely to develop food allergies. I hated giving Josie formula. Spooning powder from a can seemed like the antithesis of nourishment – it was the ultimate processed food. I was anxious to start her on solid foods, but I followed the conventional wisdom and waited until she was 6 months old to give her a bite of cooked sweet potato. In spite of my efforts, or maybe because of them, she’s currently allergic to eggs, soy, white fish and tree nuts. Doctors Hugh Sampson and Scott Sicherer at Mount Sinai Medical center have found that food allergens are unavoidable and babies come into contact with protein molecules though particles in the air and on skin and in other food and that by giving them such small doses we are actually making their systems more sensitive and more likely to develop allergic responses. Now what? The retraction of the previous recommendation leaves a hole where the current advice should be placed, but there’s nothing there. At this point, all we know is that we don’t know what we thought we knew and I guess that’s a great first step. When did you introduce solids? How did that work out? Does your child have allergies? This entry was posted in Baby Girl, Food, Gluten-free, HMN Reports, Lactose, Parenting on May 27, 2011 by Katherine. So far, neither kid has anything but hay fever and mild sensitivity to acidic foods. I have also been fortunate enough to have had two kids who love almost any food and were easy to breastfeed well past 6 months. They also seemed to tolerate anything I ate (Ethiopian food flavored breast milk, anyone? Ugh, I know). I used the Ped guidelines as, well, guidelines, and watched how my kids’ tongue reflexes developed before I added solids (so they didn’t start until after 6 months). I also watched how their system was handling it and I would hold back on the solids and go for simpler solids and breast milk, if needed. Made our own baby food based on whatever Dave and I were eating. I feel more like we have been lucky to not have allergies rather than doing something right. Barb, that is so interesting that your friends’ kids are in treatment where they get their allergen. That’s part of what I talk about in part II. Yeah, Alyssa, I certainly wonder if it has always been there and we just know what it is now. Could be. I also wonder about antibiotics. Waited with both kids until they were 6 months before solids. Breastfed Zoe until 18 months, Luke still going at 15 months. Neither has allergies. I was a bit worried about peanuts, since my dad is allergic, but so far so good. I’ve know people who restricted everything they ate while pregnant and everything they fed to their kids and their kids have the worst allergies. So maybe kids do need to be exposed more. You, my dear, were allergic to what I ate. While pregnant with you I did not tolerate dairy. Dairy is the main food group in my life. After you were born I went back to my favorite foods. Not acceptable to you. You were breast fed exclusively until you were 10 months old, and then fed very controlled solids for a very long time. At 10 months you tolerated goat’s milk just fine. Your allergies came with you at birth. And your sister? The picky eater? You remember her… she has no troubling allergies. I wish there was a little booklet that comes with each baby, a user’s manual. Katherine, The sublingual treatment is called The Lacrosse Method and it was developed by Allergy Associates of La Crosse (Wisconsin) which is about 20 minutes from my house. Sam’s pediatric immunologist thinks it’s all a bunch of hogwash and it hasn’t been proven to work, and our insurance won’t cover any visits to this clinic (as opposed to a traditional pediatric immunologist), but my friend really believes it’s working for her 12-year-old who has soy, peanut and tree nut allergies. Who knows? Oh, dear. I wonder about this all the time. I breast fed my babes and delayed solids. Neither were interested in solids in any quantity until about 11 months, though I offered them at 6 months. And I followed my naturopaths recommendation for slow introduction of foods and waiting on the big allergens. My oldest is allergic to eggs and wheat and sensitive to dairy. My almost two year old seems to be allergic to eggs, even when he gets them through breastmilk. I often wonder if my delayed introduction has caused the problem. Though, like you, it seems my two year old was allergic to eggs in my diet from birth. Sigh. Okay – so just to offer something purely anecdotal… Sam, whose first baby foods were avocados, bananas and peas, and who ravished peas and edamame and pea pods from the time he could eat solid foods but was kept from strawberries and tree nuts until he was almost 2, is now allergic to peanuts and reactive to peas and soy but has no reaction to strawberries or tree nuts. I have not decided what to do with his sister as she starts eating solids. Not quite ready to give here peas or strawberries or nuts yet, even though Sam’s allergist says to go ahead. It is a perplexing problem. Hey Barb, you can hijack my thread any time, baby. Hmm, that sounds kinda dirty. Anyhoo, that is interesting. Is tuna oil listed on the ingredients list? How did you find out it’s in there?